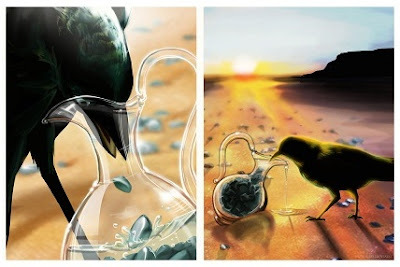 This is a very famous story of The Crow and the Pitcher, which apart from reminding us of our childhood days, gives us a very inspiring lesson. There was a thirsty crow who was looking for some water. But he couldn't find any. He was feeling very weak and tired and almost lost all his hopes. Suddenly, he saw a pitcher. There was some water inside the pitcher! The crow tried to push his head inside the pitcher but couldn't because of the neck of the jug being very narrow. The crow thought hard for a while.He saw some pebbles around the pitcher. Suddenly he started picking up the pebbles one by one, dropping each into the pitcher. As he continued filling the pebbles into the pitcher, the water level kept rising. Soon it was high enough for the crow to drink. His plan had worked! There are times when one has to face obstacles and failures. But at that point of time, one should not lose hopes and surrender. Rather he should continue to put his sincere efforts and hard work with determination. What's important is that the efforts are made in the right direction. So we should make a plan and start working according to the plan. And certainly, a time will come when we will accomplish our goals.